Recruiting is a merciless and often brutal component of the college football system. 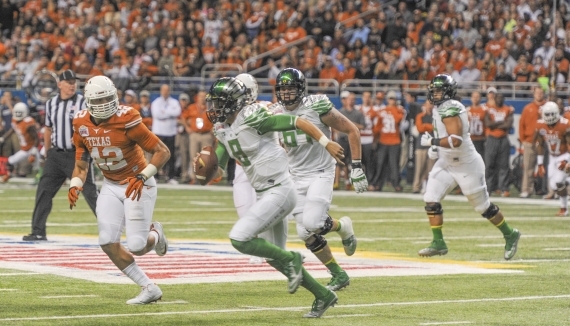 There’s no reason to sugar-coat it: the past couple weeks haven’t been ideal for the Ducks. This is not going to be another article about Budda Baker. There are plenty of those. The fact is Baker is a great player and a great kid with a chance to be highly productive in the Pac-12, on either side of the ball. His de-commitment hurts, and because of it, Oregon is unlikely to crack the top-20 of any site’s recruiting rankings. Not ideal, but it is what it is. Replacing Josh Huff won’t be easy, but Oregon has the pieces. Moving forward, there are only two weeks until National Signing Day. Oregon is still in play for a number of recruits, although the pool of who is and isn’t a target gets murkier by the day. Things are nearly as chaotic as they were at this time last year. A time when newly-minted head coach Mark Helfrich and his staff were saving the 2013 class following Chip Kelly’s departure. It seems that nearly hourly the Ducks are making another offer or an official visit is added or dropped from the schedule. It has been a confusing week. If you forced me to predict at this moment, I would guess that Oregon adds Trey Lealaimatafao, Mattrell McGraw, Khalil Oliver and Jalen Canty to their 2014 class. Both Oliver and Canty are new targets who may or may not be backup options. Regardless, it’s clear that the coaches really like both and believe they have high ceilings. At this time, the current commits seem solid, although I wouldn’t be shocked if Tony James ended up elsewhere. So, based on everything that’s going on now and the 2014 cycle as a whole, what do we know about recruiting under Helfrich? Well, I won’t hand out any grades until the cycle ends, but there are certainly some logical conclusions to be drawn. 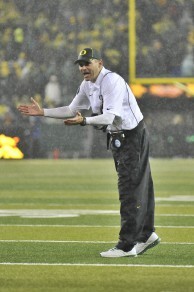 Can Helfrich close as well as he did last year? The first observation, and I want to stress this one, is that the program continues to increase its talent profile. During the past two summers, I’ve evaluated, compiled and written about the relative talent of each Pac-12 program. The articles break down and objectively rank the talent of each roster based on a comprehensive overview of the recruiting rankings for each player (using my tier system). 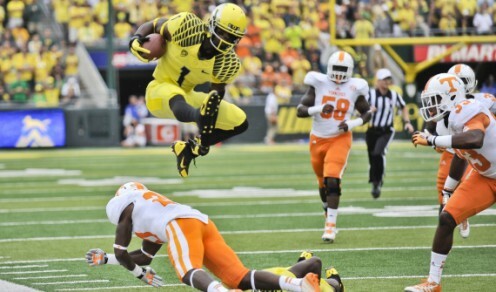 This last summer, Oregon was the 2nd most talented team in the conference, behind only USC. While both UCLA and Stanford are right on their heels, the Ducks are still in good shape to maintain their position heading into next season. Not only that, Oregon is actually increasing the number of tier-1 players on its roster (a tier-1 player earns that designation by receiving a 4-star rating from at least two of the major recruiting outlets). That’s a positive sign. In the coming years, it will become harder and harder for Oregon to continue improving as it nears its talent ceiling, and it is approaching that point. However, maintenance will be sufficient to stay competitive. Now, while the overall talent profile of the program will improve due to the 2014 class, that doesn’t mean this should be touted as a “great” class. I think “good” is more appropriate. “Great” implies surpassing reasonable expectations, which this class is not likely to do. Most of those with a good understanding of college football recruiting, and who follow such things, earlier this summer expected Oregon to end up between No. 15 and No. 20 nationally. Obviously, an isolated team ranking is insignificant (I’ve devoted entire articles to that very topic), but it does help us when comparing reality to expectation. There’s no question that this is going to be a good class which includes recruits who could make an immediate impact, and end up as all-conference level players down the road. 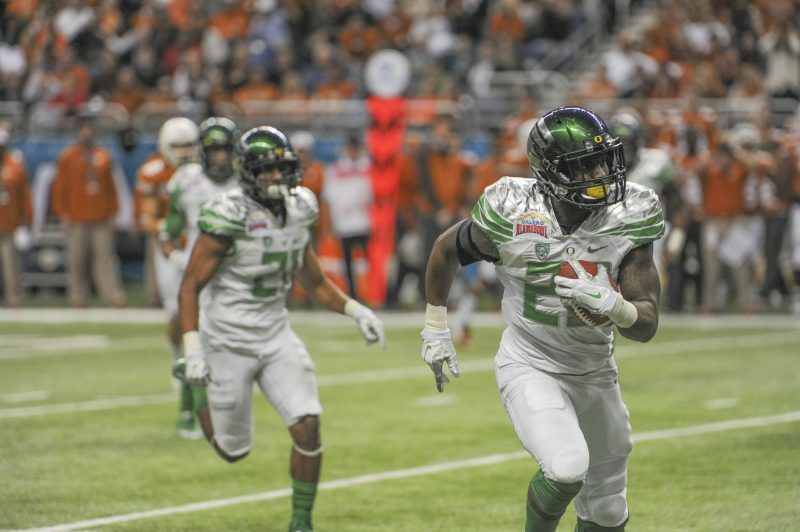 For Oregon to remain nationally relevant, the 2014 class will need to be the baseline. Some may not like that, but it is reality. A top-15 class should always be the goal. Naturally, the question becomes how to achieve that. Adding talent along the defensive front-7 is a point of emphasis. Helfrich and his staff are not unaware of the harsh recruiting realities and evolving landscape. This year, they’ve cast a wider net and have begun offering targets earlier in the process. That needs to continue into 2015 and beyond. The more targets you have committed before the season begins, the better. Early commits means you have more player recruiters (players recruiting players is very effective). This then entices others to join a class that looks like it has the potential to be really good (great players want to play with great players). It also allows the staff to focus their limited resources on other, uncommitted targets during and after the season. Additionally, casting a wider net means having the ability to leverage pre-existing relationships when things don’t go as planned and it becomes necessary to lean on backup options (which happens every year). Running around at the last minute in January trying to fill spots with players you’ve had limited contact with, is not an effective recruiting method. While the 2014 class will go down in the books as a good one, calling it “great” is probably something reserved for the most optimistic fans. While good is good, and occasionally ok, that doesn’t make the grade for a team with national aspirations. The program must continue evolving its recruiting processes moving forward.